The startup picks a deep-pocketed buyer to move its GaN-on-silicon LED tech to market. LED startup Bridgelux has always faced some big questions about how it will scale up to break into a $100 billion future global solid-state lighting market. That’s particularly true when it comes to the Livermore, Calif.-based startup’s four-year effort to develop a next-generation LED that uses gallium-nitride on silicon, rather than expensive sapphire, to open semiconductor manufacturing economies of scale and capabilities to the LED field. Now Bridgelux has revealed how it intends to bring that GaN-on-silicon technology to market: by selling it to Toshiba. The Japanese lighting, chipmaking and electronics giant announced Tuesday that it’s buying Bridgelux’s GaN-on-silicon technology and related assets, essentially taking over the startup’s $80-million-plus investment in the technology, in order to take it from R&D to commercial scale in the next six months or so. 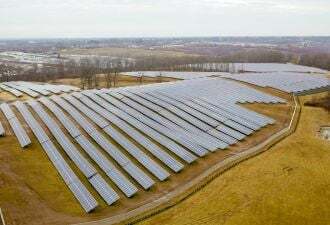 Financial terms of the deal weren’t disclosed, leaving open to speculation whether or not Bridgelux and its investors realized a return on the money sunk into the GaN-on-silicon work so far. Of course, that list of investors includes Toshiba, which started working with Bridgelux on the technology in early 2012. Now, the two will expand their licensing and manufacturing partnership, with plans to bring new products out in the next twelve to eighteen months. Beyond that, Bridgelux and Toshiba are looking at expanding the range of applications for the new technology into different forms (lights, backlighting for TVs and computer displays), as well as non-lighting applications such as power management chips, Tim Lester, Bridgelux’s chief financial officer, said in a Tuesday interview. In the longer run, using silicon as a substrate could allow Bridgelux and Toshiba to develop LED chips with digital functionality, such as driver controls, dimming, and even wireless communications, embedded on the LEDs themselves, he said. Of course, that’s much further down the road, he said. Bridgelux’s deal with Toshiba doesn’t include the startup’s entire technology portfolio. 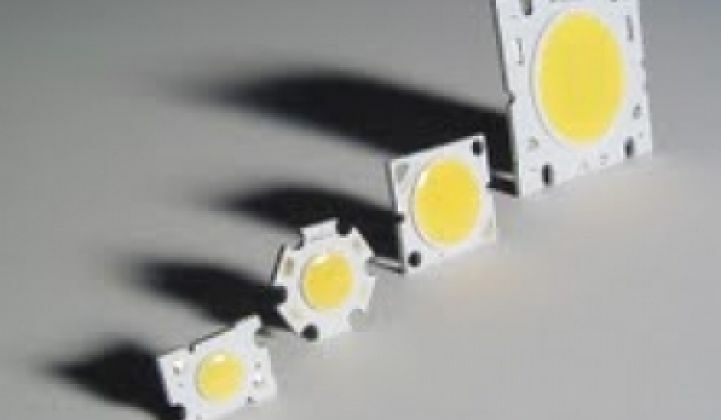 Like many of its competitors, Bridgelux now makes LEDs out of more expensive sapphire substrates, and those products, now made by contract manufacturers in Asia, account for all of the company’s product revenues, Lester said. That means that Toshiba’s purchase of its GaN-on-silicon technology isn’t expected to affect Bridgelux’s expectations for 2013 annual revenues of about $100 million, up from the $86 million it reported in 2012. As for internal investment, Bridgelux has raised about $250 million since its 2002 founding, with about $100 million of that since 2010, when it kicked its GaN-on-silicon work into high gear. Still, Bridgelux has obviously bet its future on its new GaN-on-silicon technology, and Lester added that the company is “looking at a lot of options about how [it is] going to produce that technology." In that light, the deal represents the best option for the startup to conserve its capital and focus its attention on its area of expertise, he said. That isn’t semiconductor manufacturing, which Toshiba is quite good at, but rather improving its chip design, as well as the chain of technologies that transform these silicon-based LED chips into a range of lighting products, he said. Tuesday’s deal “gives us capital to continue R&D, because they’re giving us cash -- and our R&D can be focused on solid-state lighting applications,” he said. About 40 Bridgelux employees, or 15 percent of its workforce, will now be Toshiba employees, though they’ll remain employed in Livermore, Lester said. Meanwhile, Bridgelux is now working with Veeco, the maker of the semiconductor fabrication equipment it’s now using to make its GaN-on-silicon chips in Livermore, to modify similar machines in Japan for Toshiba to start churning out the 8-inch wafers that serve as the core of its new LED chips, he said. That 8-inch wafer represents a pretty big leap from the smaller, more specialized 2-inch to 4-inch sapphire substrate wafers now used to make most LEDs, Lester said. That increases yield in terms of the number of chips per wafer -- about 20,000 per 8-inch wafer, versus 900 for a 2-inch wafer -- and is expected to yield prices that are 40 percent to 50 percent lower than sapphire-based LEDs on an equivalent performance basis, he said. Of course, Bridgelux isn’t the only company working on cheaper, more versatile replacements for today’s sapphire-based LEDs. LED company Cree is breaking records in terms of lumens-per-watt out of its silicon-carbide platform, and startup Soraa raised $88.6 million last year to develop its gallium-nitride on gallium-nitride substrate LED technology, to name two examples. Toshiba is just now starting to release silicon-based LEDs, and in the next six months or so, Bridgelux expects to have early forms of the technology built into lighting products, though not its higher-end systems, he noted. In the next twelve months, the companies expect to have lighting systems in production that will match the performance of sapphire-based LEDs at a much lower price, he said. As for how Bridgelux plans to integrate what will now be Toshiba’s LED chips into its own product sales, Lester pointed to the work the startup has been doing to build a complete packaging system for its sapphire-based LEDs. Called Vero, the product line is aimed at making it easier for lamp manufacturers to integrate the devices into products, with a 20 percent higher lumen density, a solder-free connector port, and the capability to add new interconnection features. Packaging makes up about 60 percent of the total cost of LED lighting systems today, and with LED chip prices themselves dropping fast, those balance-of-system costs are expected to be the next focus of cost reduction for the industry. Over the course of the next year, Bridgelux will be working with Toshiba to integrate its GaN-on-silicon LEDs into its Vero chip-on-board structure, Lester said. Beyond that, however, Bridgelux also wants to collaborate with Toshiba to embed a good deal of that digital control and integration architecture into the 8-inch wafers themselves, he said. That’s very difficult to do on sapphire substrates, but much simplified when using silicon as a substrate, he said. Bridgelux envisions adding such core capabilities as LED driver functionality, dimming capabilities, and even wireless communications into its wafer-level processing, he said. We’re seeing a lot of work underway to integrate these various functionalities, both from players at the bulb level (Philips, General Electric, Sylvania, Lighting Science Group, Switch, LEDnovation, Lemnis, LEDwiser) and at the fixture or networked lighting layer (Daintree Networks, Redwood Systems, EnLighten, Lunera, Digital Lumens). At the end of the rainbow for all these contenders is a massive potential market for LEDs to revolutionize the way the world uses electricity to make light. LEDs consume about one-tenth the power of incandescent bulbs and about half of the power of CFLs. LEDs can last 50,000 hours, and incandescent bulbs are slowly being outlawed across the globe. Groom Energy and GTM Research predict that the LED enterprise lighting market will surpass $1 billion in annual revenue by 2014. LED fixture prices have fallen 24 percent in the past two years, and the prices will continue to come down. That makes for a lot of competition on the price side, as well as constant jockeying for position as the highest-quality replacement for various specific lighting form factors, from high-end retail spotlights to old-school fluorescent tubes.